Between the years of 2007 and 2011, a publisher named Running Press issued a series of beautifully written and produced Vault books on the histories of comics’ biggest companies (Marvel and DC Comics — both previously reviewed by me, here at CWR) and their top characters (Batman and Spider-Man). Despite the similar title, this new 2015 Avengers Vault book, from a different publisher, Thunder Bay Press, is not like those books. In fact, I think the best thing I can say about it is that it’s one of the most generic “history” books about comics ever produced. It’s not a decent coffee table book — it’s more like an “end table” book. Most of its problems are evident in its production. The book’s spine feels loose, although it may be intended as a stay-flat binding. Either way, it creaks and groans with every page turn; it disturbs me when books make noise while you’re reading them. It’s also not very visually appealing. The original vault books were quite impressive with their oversized (10.7” x 13”) horizontal format, unique spiral binding, and bound-in plastic sheets, allowing for both attractive display and the easy removal of the book’s actual artifacts. This new book is a standard 12” x 8.7” format, portrait instead of landscape orientation. The artifacts are dealt with much differently in this new book. Unlike previous Vault books, where the artifacts were (mostly) presented within the book’s text, and in clear plastic enabling you to instantly see them, the artifacts in this book all come in book-sized, flimsy cardstock envelopes bound in at chapter breaks. Because of the difficulty of trying to get these things out of the envelopes (hint: turn the book upside-down to safely get them out, without tearing the envelope or its stupid flap — which you know will be torn off eventually), the artifacts are most likely destined to be looked at once and then forgotten — which is one of the definitions of “generic”, I believe. WARNING: If you do decide to buy this book at a bookstore, take a minute to flip through the book before going to the check-out to make sure the envelopes haven’t already been destroyed (or the artifacts stolen) by previous browsers. Both can be accomplished fairly easily. The coolest artifact here is probably the reproduction of Ralph Long’s (whoever he is) actual Captain America Sentinels of Liberty membership card from 1941, although it’s easy to miss because of its size. Unless you have hands like Dooneese (the tiny-handed character played by Kristen Wiig on Saturday Night Live), you need to shake the tiny membership card out of the book, or you will tear the envelope trying trying to fish for it. Runners up for “neat reproduction” would have to be Walter Simonson’s mini Thor-frog promotional poster and the multipage “All About Iron Man” featurette with artwork by Don Heck. 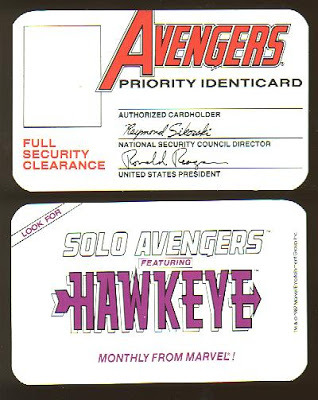 The one artifact that really should have been here (and isn’t) was the promotional Avengers membership cards that were originally issued by Marvel in the late 1980s. These were brilliant because they were partially blank, allowing fans to sign them and attach a photograph or drawing of themselves. Who wouldn’t want to be an Avenger?! Or at least have their super-cool membership card! It was signed by then-President Ronald Reagan and (fictional) National Security Council Director Raymond Sikorski. They were a huge hit with fans, and I know folks who still carry theirs in their wallets. One of the biggest problems with the book is the horrible typesetting. The entire book is double-spaced, which gives the impression of cheaping out by limiting the word count, and then spreading the text out to make it look impressive. (You know, like you did in your book reports when you were eight years old and didn’t know any better.) Further, much of the book’s text is not properly kerned (adjusting the typesetting — sometimes manually — for a more pleasing reading experience). Whenever the text has to wrap around a graphic larger than the book’s columns, there are unsightly and frequently huge gaps of space between words in the text. Further, the book designer has placed a number of huge graphics in the upper left corner of the left-hand pages. Due to their large size, I frequently missed the three or four lines of text in the left column, since natural eye-flow takes the reader from the large graphic directly to the right column of text. The book is literally an unpleasant chore to read — or at least it was for me. Which is something that really shouldn’t ever be said about Peter David’s writing, which here is mostly up to his usual high standards. There are a number of great behind-the-scenes stories about comic history — and even a debunking of some previously accepted comic book lore, notably about the real-life origins of The Avengers comic book. It’s a well-written history, but (and here’s that word again) somewhat generic, possibly because of restrictions in word count. Also, one gets the sense that the manuscript may have been sitting around for a while (and not updated), considering that there is no mention of the somewhat controversial changes in the current Avengers publications. Current writers Jonathan Hickman and Rick Remender have really changed the structure and storytelling over the last couple of years — not to mention radically expanding the membership. Unfortunately, this omission has pretty much rendered the book’s Appendix: Complete Avengers Roster incomplete and out-of-date before it was even published. Since this book is clearly intended to ride the coattails of the upcoming movie, that may not make much difference to the likely reader. The one nod to current publishing history is the inclusion of last year’s promotion of the Falcon to be the current Captain America, although there is no mention of why this happened, and it seems somewhat shoehorned in. The best chapter here is the one devoted to the Incredible Hulk — not surprising, since Peter David is the author of an astounding (and award-winning) twelve-year run on the character and the comic book series. Granted that some very silly comic book stories and plotlines from the less sophisticated, early eras of comics are recounted here, there is some unfortunate snarkiness that creeps into the text. Now, I enjoy snark as much as anybody, but I have also become aware over the years that there are a lot of fans who don’t appreciate their favorite characters (or plotlines) being made fun of. So if that bothers you, caveat emptor applies here. On the other hand, there are some beloved characters and weirdly constructed Marvel stories (including many of the “continuity implant” variety), where nothing but snark will do while attempting to summarize them. Seriously. Another depressing note: I didn’t immediately recognize the cover artist. The image is a fairly generic shot of the movie Avengers (plus the Falcon). I was briefly impressed when I saw that there was a page of actual Image Credits listed in the Table of Contents. Turning to it, I was dismayed to find that most of the “credits” said “courtesy Heritage Auctions”. Fortunately, most of the interior art that comes directly from the comics is attributed to actual artists. I still don’t know who drew the cover. For all I know, it may just be clip art, which — warning — is also used in this book.